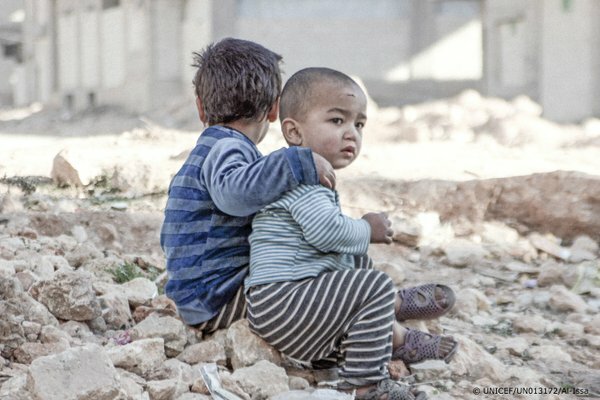 “3.7m #childrenofsyria  under 5 have known nothing but a lifetime shaped by war,” tweets @UNICEF . Today marks the fifth anniversary of the start of the Syrian revolution, which has turned into a bloody civil war estimated to have claimed the lives of up to a quarter of a million people. And while the number of those killed since the protests started in Syria are disputed , the Syrian Observatory for Human Rights  says more than 270,000 people have been killed in Syria's five years of conflict. The observatory provides other staggering figures of the toll on Syrians this revolution-turned-civil war has had so far: 2 million people have been injured, many with permanent disabilities, and 11 million Syrians have been internally displaced or forced to flee the war-torn country altogether. This video  of the first protest which took place in Damascus on March 15, 2011, shows scores of people marching and chanting: “Where are you Syrian?” in a rally call to encourage more protesters to join them to demonstrate against the regime of Bashar Al Assad, which met protesters with bullets, barrel bombs, mortar and aerial bombardment and chemical attacks. The narrator says this was the first anti-regime protest and that Syrians of all sects, including Sunnis  and Alawites , were involved. Protesters are also heard chanting: “Allah, Syria, and only freedom!” and “Peaceful! Peaceful!” indicating that they were after a peaceful revolution. But that was not to be. As the protests got out the regime's control, Jihadists from around the world, bankrolled by money from oil-rich Gulf countries, rose to protect their Sunni brothers against the onslaught of the Alawite rulers of Damascus. Those fighters formed the nucleus of what was to later on become ISIS, which has carved itself an Islamic caliphate across Syria and Iraq. Meanwhile, Iran and Lebanese militia group Hezbollah  came to the rescue of the Assad regime, followed by the Russians, who just announced the withdrawal  of their land troops yesterday while maintaining airstrikes. Today's anniversary is being marked on social media under the hashtag @withSyria , which shows many people lending their support to the campaign which encourages supporters to take photographs of themselves with their hands folded like a dove (sign for peace). It is not a civil war. It is not a crisis. It is not a conflict. It is a revolution! Kafranbel, a small Syrian town in Idlib, has had massive media coverage since the start of the revolution, thanks to the photographs and videos its activists share of protesters carrying banners, like the one above, addressing the world. #TheRevolutionContinues  #Syria  demonstrations against #Assad , every photo is taken from a different city.